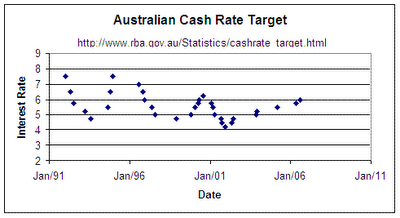 To get a better feel for how good a strategy gearing is, I've first looked at the current interest rates available for margin loans (and how it depends on the amount borrowed) and the current spread between the margin lending interest rate and the target cash rate set by the reserve bank. 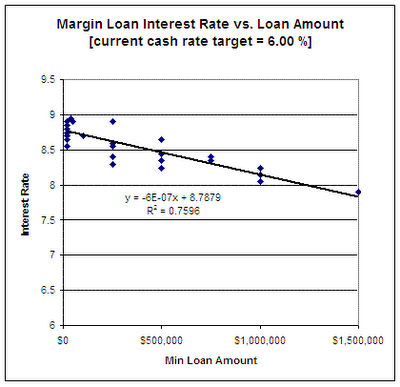 The graph shows that the interest rate charged on a margin loan varies considerably between the different margin lenders, so it pays to shop around. Generally, the interest rate is reduced for clients with a large loan balance, so it's probably worth having one large loan rather than spreading it between several lenders (this is something I need to fix over time, as I currently have three different margin loan accounts. The problem is the tax effect of realising capital gains when transferring holdings from one lender to another). It can be seen that the current spread between the target cash rate (6.00%) and the typical margin loan interest rate on a $500,000 loan is about 2.5% - so I've assumed this was the typical spread during the past ten years or so. This table confirms that the use of gearing would have boosted your returns during the past decade - from an average of 8.13% pa without gearing, to 8.62% using 100% debt:equity (a 50% loan:value ratio), and 9.11% using a higher gearing rate of 67% LVR (close to the normal lending limit of 70%). However, it also clearly shows that the use of gearing greatly magnified the ups and downs of a portfolio - the relatively modest 11.47% drop during 2002 would have meant a 48.53% drop in value of a portfolio using 67% LVR, and probably would have required more cash being added into the account to avoid getting a margin call. In the long term, getting a return of 9.11% instead of 8.13% will have a large effect on your final net worth - if inflation averaged 3% this would result in a real return of 6.11% rather than 5.13% (an improvement of 19%). It is important to watch your LVR when using gearing, be conservative when the market is setting new highs, and be prepared to manage your portfolio to avoid any margin calls. It is also very important to shop around for the best possible interest rate - possibly using home equity to obtain lower rates.